Jersey will have no locally-born players in their squad for the first time after releasing backs Jack Burroughs and Ed Dawson. Dawson, 26, is the last one to have played for the club having helped them rise up through the leagues to the Championship. The winger played just one game in the British and Irish Cup this season. Burroughs, 22, was the last local player to earn a deal at the club. Since signing professional terms in 2013, he has played in 28 matches, scoring five tries, and was a regular in the side during 2014. The pair's release means there are no island-born players in the Jersey first-team squad for the first time in the club's history. 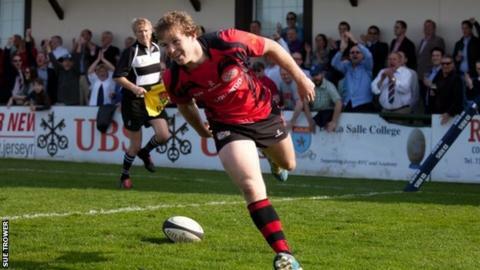 A total of 15 players will leave St Peter this summer, with Jersey having already announced that Argentina international Ignacio Lancuba will return to his homeland for family reasons, while Sam Lockwood has agreed a deal with Premiership club Newcastle. Lancuba's Argentina compatriot Martin Garcia-Veiga will also leave St Peter, as will Irish back Mark McCrea and second-row Dave Markham, who have both been with Jersey since they won promotion to the Championship in 2012. "I've told some players that they aren't in my plans going forward," said head coach Harvey Biljon. "There are also those who have agreed moves to other clubs, and some who have decided to leave due to family reasons, personal circumstances, or in order to pursue new opportunities. "It's a difficult time of year, but we wanted to confirm the situation so everyone knows how things stand ahead of our last home game and the following week's awards night. "All those who are leaving have played their part in a good season for the club, helping us to our best Championship finish and enabling Jersey to be an established presence at this level. "It's not just about the 15 players who start games, or the seven on the bench; our results stem from the attitude of the whole squad in their professionalism and preparation. "I'd like to thank all of those leaving and wish them all the best for the future." Russell Anderson, Jack Burroughs, Mark Cooke, Ed Dawson, Ollie Evans, Ben Featherstone, Martin Garcia-Veiga, Danny Herriott, Sam Lockwood, Dave Markham, Mark McCrea, Jack Moates, Rhys Owen, Ignacio Lancuba, Tommy Spinks.